Disclaimer: All reviews being done on this post is based on my personal opinion. 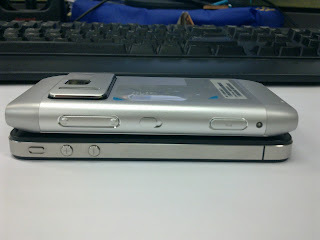 N8 is thicker than iPhone 4. iPhone 4 is really really thin. 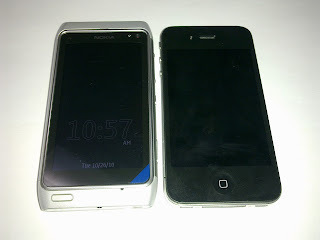 You can see that somehow, the n8's display is not that close to its protective glass compared to iPhone's. I also cranked the N8 and iPhone 4's screen brightness to full and its distinguishable that iPhone has a better display than N8. One thing that I notice though is that its more comfortable to hold the N8 (no offense to iPhone 4 users, this is a subjective opinion) due to its curvature on the sides where as the iphone 4 has almost edgy sides, you can feel the sharp edge on your fingers, while its easier to hold the iphone if your holding on using the front and the back plate (which is not the usual case of holding a phone). Both phones feels solid due to the mono-blocked aluminum casing but the N8s feels more sturdier. I also have the weird feeling of being able to drop the iPhone 4 accidentally. 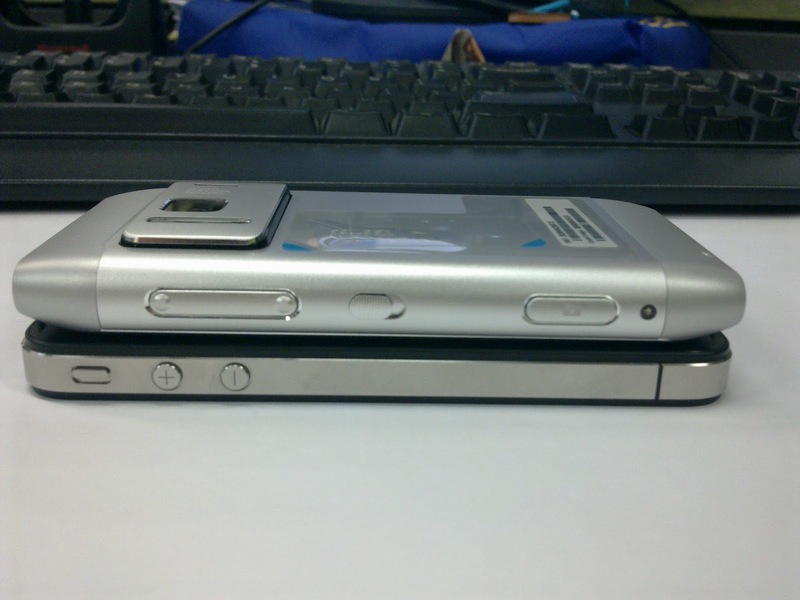 Once you got hold of both phones, you'll notice readily that you have more grip with n8. Your fingers feels like it is wrapped around the N8 making it feel safer in your hands. Another thing I noticed when it comes to portability is that its easier to put the N8 into our pockets at the back of our pants (specially the tight ones). There's no problem on the side pockets for both phones but on the back pants, it feels uncomfortable to put the iPhone on it since you'll feel like you'll break the glass plates anytime. Don't fret iPhone users, you have advantage to N8's pocket-ability when it comes to the pockets on our polo. 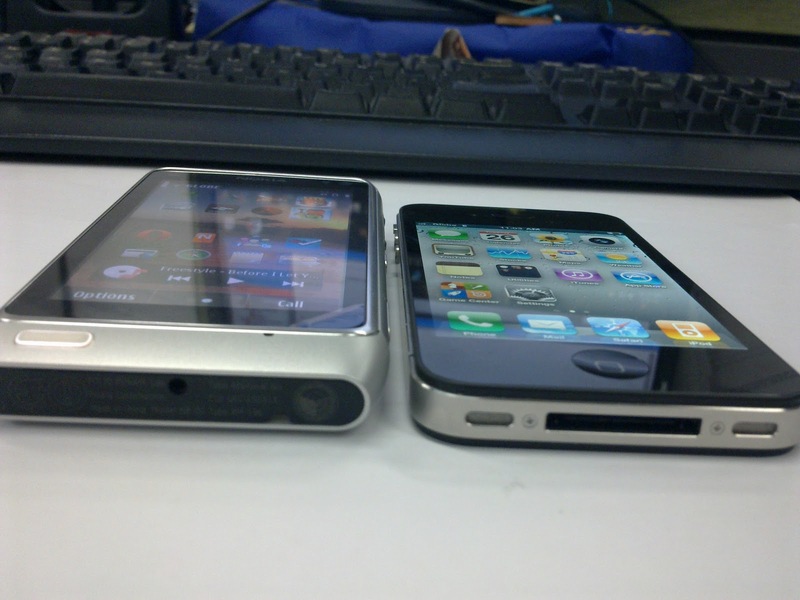 Because iphone is surprisingly thin, it is not-surprising that the iphone 4 fits beautifully on our polo pockets. No bulge can be readily noticed by other's eyes and the phone is short enough to be concealed inside it. 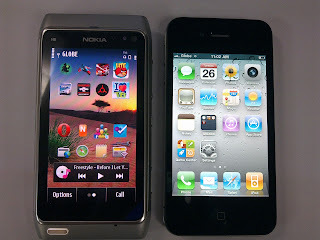 I love the look of iPhone 4 but I love the N8's feel. I also love the N8's look or design somehow and that added to my decision of acquiring this phone instead - aside from the functionalities N8 can offer. "You can see that somehow, the n8's display is not that close to its protective glass compared to iPhone's." That's why iPhone 4's screen is prone to cracks when dropped. 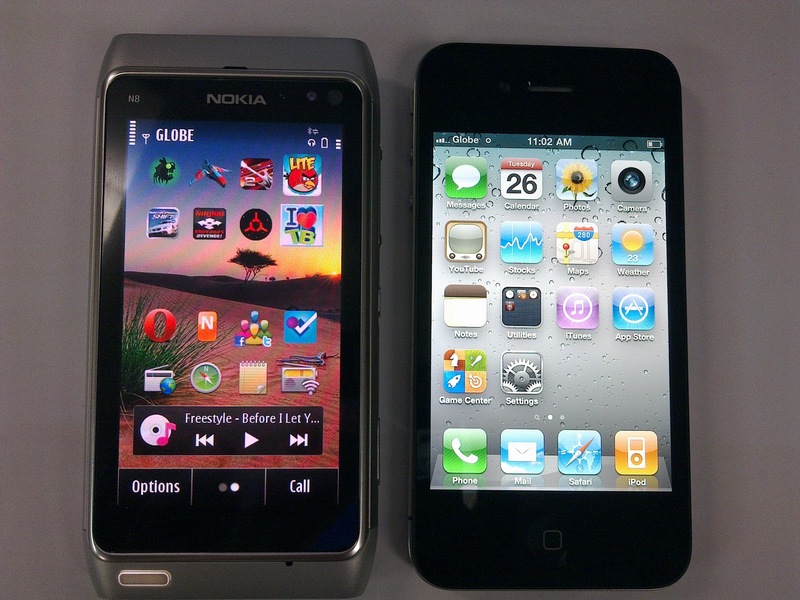 So far CBD technology of Nokia could par Retina Display yet Nokia should increase resolution in order to topple its competitor's screen. and unluckily, CBD is not incorporated on N8's display. sigh.